We’ve reviewed a lot of binary trading scams recently, and today we encountered App Mobile Bot. Is App Mobile Bot as good as what Gunnar Erikkson claims? More importantly, is App Mobile Bot a scam? From the first glance, the layout of App Mobile Bot looks extremely familiar. Brushed metal, an apple icon on a grey background, and clean Helvetica Neue font on a white background. Wait, AppleBot? Could it be related to the technology giant Apple? Nope, not at all. 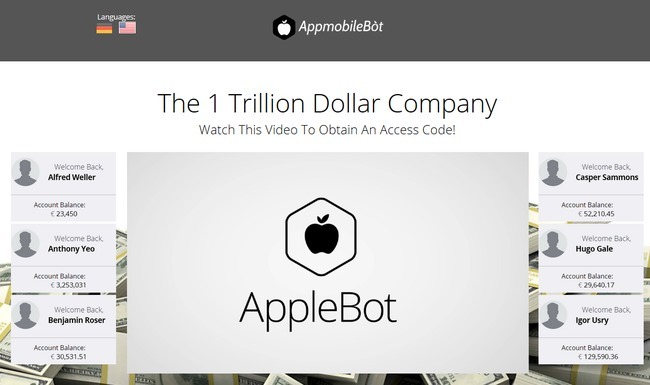 App Mobile Bot, or AppleBot as Gunnar Erikkson calls it is just a binary trading bot riding on Apple’s name to lure you into a financial headache. App Mobile Bot is in no way affiliated, or endorsed by Apple at all. It is just a binary trading robot that is designed to automate your binary options trading. To make sure everyone is on the same page, let’s take a little detour and talk about binary options. Binary trading is gaining momentum in the recent years due to its simplicity, and that’s why so many scams are riding on the binary options hype now. Binary options is basically trading reduced to its simplest form. Instead of reading up financial news and analyzing charts, with binary options, you only predict if the price of an asset will rise or fall after a short period of time, usually between 30 seconds to minutes. When the time is up, there will only be 2 outcomes – you are either right, or you are wrong (hence the name binary options). For example, I predict that the price of gold will rise after 3 minutes, and I bet $50 on it. If I win, I’ll gain a certain percentage of what I bet, let’s say 60%. So if I guess correctly when my 3-minute contract is up, I win $30. But if I’m wrong, I lose the entire sum that I bet. To put it simply, binary options is very much like gambling. There’s no good way to make an educated guess on market movement in such a short period of time. In most cases, you are just guessing based on your gut feelings and luck. Even if you manage a 50% win rate, you’ll still lose money given the uneven winning vs losing payout of binary options. What Does App Mobile Bot Do? 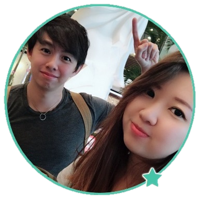 App Mobile Bot is a binary trading robot, where it trades your binary options account for you automatically. You don’t even have to decide whether the market will rise or fall, the robot will do it for you. But does it work? There are hundreds of automated trading robots out there, and all of them claim they can make you a binary options millionaire. Just look at the other binary trading scams like Free Money System by Walter Green, Millionaire in PJs by David Williams, and Auto Money App by Daniel Rosenberg. There are no shortage of binary trading bots out there. Have you seen any news of millionaires who attained their wealth from binary trading robots? None. Even Forbes, the renowned financial website warns you against gambling on binary options. In fact, the vast majority of traders lose money in binary trading. Using an automated trading bot is a surefire way to get your account wiped out. And if the robots really work as well as their owners claim, why are they giving their robots away for free? The reason is simple. They are out to get your money. Why Does Gunnar Erikkson Promote App Mobile Bot? You may wonder why Gunnar Erikkson makes so much effort promoting App Mobile Bot and gives away the software for free. Firstly, if you decide to use App Mobile Bot and register for a broker account through their sales page (which contains their affiliate link), Gunnar Erikkson and the team behind App Mobile Bot will earn a referral fee as soon as you make your first deposit. You will need to deposit a minimum of $250 to start using App Mobile Bot. Not only that, App Mobile Bot will continue to make money off you over the long term. They earn a commission for every trade that you make. Or rather, for every trade that App Mobile Bot makes for you. Remember that the app runs completely on autopilot? That’s the scary part. The trading frequency is determined by them, which means they can fully control how often your account trades and how much money to make off you, as long as you still have money in your account. Gunnar Erikkson will profit regardless of whether you make or lose money, ALL AT YOUR EXPENSE. Is App Mobile Bot a Scam? It is clear that App Mobile Bot is a scam, and they do so by riding on the technology giant, Apple’s back. There is absolutely no connection or affiliation between App Mobile Bot and Apple’s company, despite the heavy mention of Apple in their sales materials. Not only a scam, it appears that App Mobile Bot is a spam too. You can watch the full sales video of App Mobile Bot on YouTube, and while you are at it, take a look at their YouTube comments section. Should I Try App Mobile Bot?